New Google Play Music: Google has officially released the new version of Google Play Music with some major changes. This new update is included along with the search results and recommendations of music. This latest Google Play will roll out in this week to 62 countries on three ways of services such as Android, iOS, and the web. This new version will provide you to your location, activity, and weather for the music playback. By using those personal data, google will give the music based on the situation such as home relaxation, flying, communicating, and more. 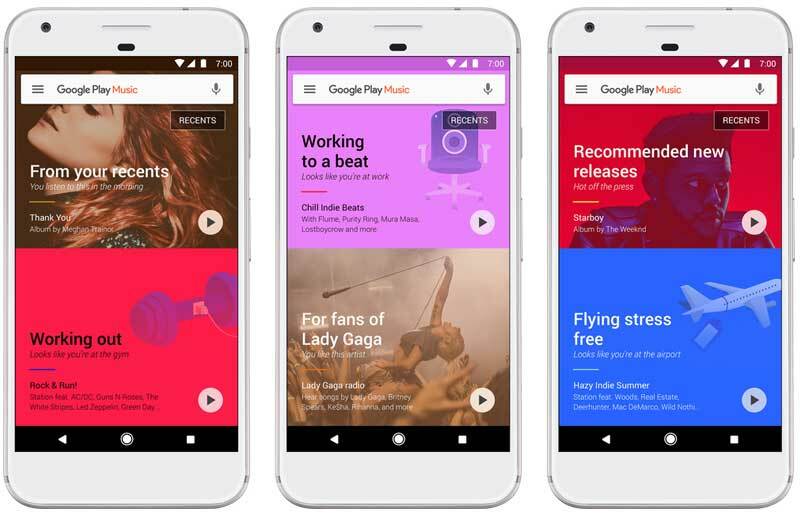 The new music and playlists will offer by using the new panels on the home screen of new Google Play Music by using the personal information of the users such as current activity. Also, the offline playlist feature will be available for the subscribers. And the offline playlist will fill with the tracks of recently heard music. When to compare with Apple Music and Spotify, it is a better compete on new UI and playlists tools. Get detailed information about this new Play Music on official release note by Google. Just checking on Google Play for this new update. The official release of this new Google Play Music will be rolled out on this week.